What is Cryptococcus, who does it affect and how many people does it kill each year? Dividing Cryptococcus neoformans cell stained with India Ink. India Ink is excluded from the polysaccharide capsule surrounding the Cryptococcus cell, resulting in the appearance of a halo around the cell. Image courtesy of Z Li and K Nielsen. Invasive fungal infections, such as Cryptococcus, are estimated to kill one and a half million people every year. Cryptococcosis, the disease caused by Cryptococcus, is currently the most frequent cause of brain infections, or meningitis, among adults in Africa, and causes 15-20% of all deaths related to AIDS. Even with access to the best available treatments, 20-40% of people with cryptococcal meningitis die. Ten-week mortality remains unacceptably high, ranging from 30-70% depending on availability of care (5-7). Interestingly, cryptococcosis is rare in healthy individuals, suggesting the immune system is able to prevent disease. Yet the high mortality observed clinically suggests current antifungal drug treatments are inadequate in immunocompromised individuals, even though antifungal drugs often have robust in vitro activity. This paradox suggests we are missing critical components of the Cn-host interaction. Characterization of cryptococcal cells during infection has revealed that Cn produces a unique cell type -referred to as “titan cells”- during infection that alter the host-pathogen interaction. 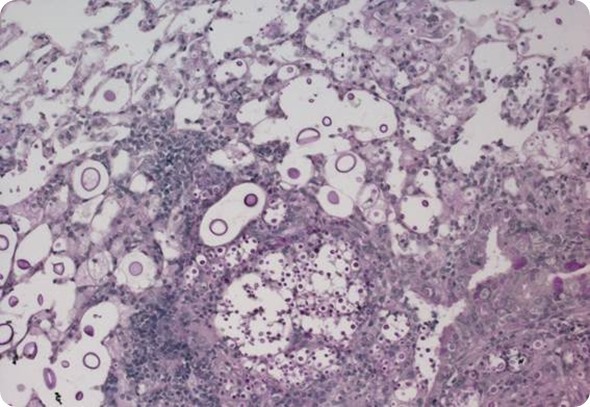 Histopathology section of lung alveolar spaces containing Cryptococcus titan and typical cells. Image courtesy of LH Okagaki and K Nielsen. Why is Cryptococcus often forsaken by research? One reason you probably haven’t heard of cryptococcosis is because it is rare in healthy people. Instead we tend to see disease in people whose immune systems are not functioning properly due to AIDS, or medical treatments such as organ transplantation and cancer chemotherapy. I think the agencies who fund medical research believe if we can find the cure for cancer and AIDS, then Cryptococcus is no longer an issue. But we’ve been searching for these cures for decades and millions of people have died from Cryptococcus because we haven’t adequate support for Cryptococcus research. In addition, organ transplants and immune-related diseases such as diabetes and lupus are on the rise, with many of these treatments putting patients at greater risk for Cryptococcosis. This disease isn’t going to go away so we really need basic research to understand how Cryptococcus causes disease. This leads to the second reason why Cryptococcus has been forsaken by research – it is a very complex disease caused by a very complex organism. Evolutionarily, fungi are much more closely related to humans than bacteria, viruses or even plants. Fungi such as Cryptococcus have many of the same basic processes as human cells, so identifying drugs that kill Cryptococcus cells without also damaging human cells is very challenging. To overcome this problem, we need a more targeted approach to drug design that first requires identifying the unique processes Cryptococcus uses to cause disease and then specifically designing drugs that target these processes. 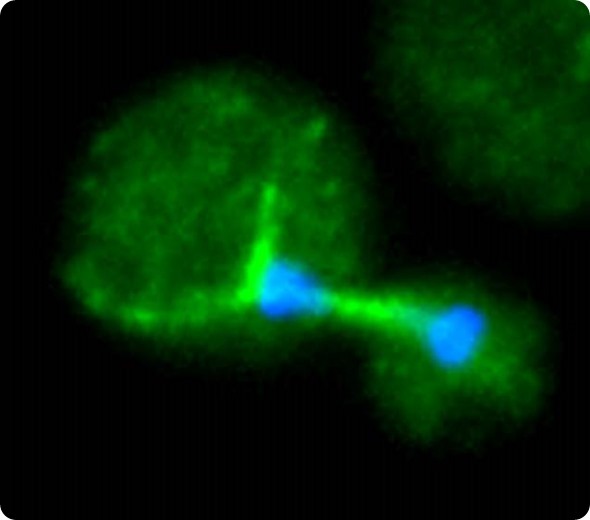 Dividing Cryptococcus neoformans cell expressing Green Fluorescent Protein (GFP)-labeled cytoskeletal tubulin and stained with DAPI to visualize the nucleus. Image courtesy of MS Fu and K Nielsen. How do you hope to change this? My research program has focused on understanding what allows Cryptococcus to cause disease. We are exposed to fungal spores with every breath we take, yet these fungi don’t cause disease because they are not able to rapidly adapt to the dramatic change that occurs when they go from the environment to the human. The human body that not only has a higher temperature than the environment but also an immune system that is trying to kills the fungal cells. My research group has shown that Cryptococcus produces a new cell type – called “titan” cells – that are critical for this transition from the environment to the host. 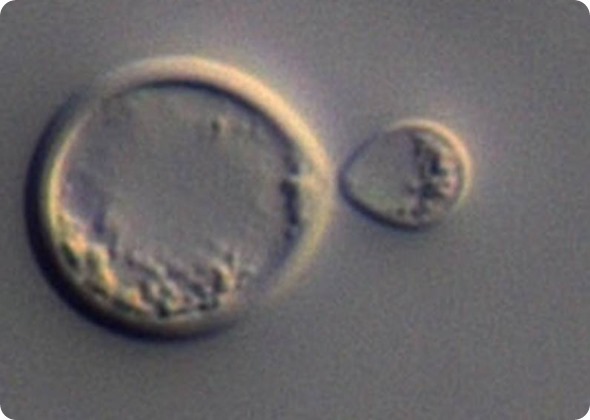 A Cryptococcus neoformans titan cell dividing to produce a mutant daughter cell. Image courtesy of LH Okagaki and K Nielsen. What is currently known about the way in which the titan cells allow Cryptococcus to adapt to the host? Titan cells jump-start the process of evolution and natural selection, allowing Cryptococcus to very rapidly adapt to the human environment. 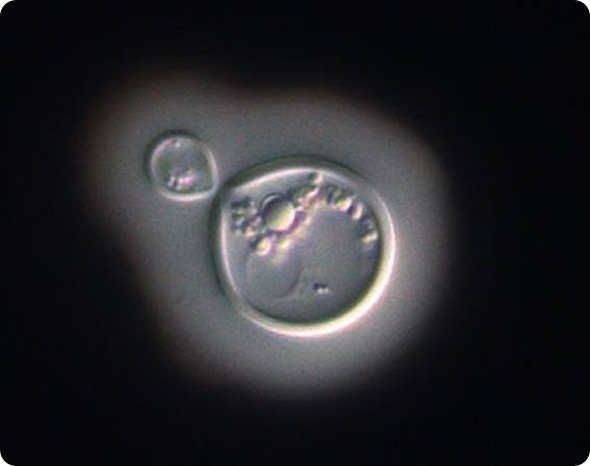 Evolutionary processes that would normally take hundreds or thousands of generations Cryptococcus can accomplish in just one or two generations. To use a comic book analogy, it is a bit like X-men brought to life – where new traits that improve survival appear to “spontaneously” occur in an individual. Cryptococcus isn’t quite as mysterious as the X-men because we actually know that titan cells must first be formed and we’ve also identified some of the molecular processes that are required for the genetic changes underlying the new traits. How will you integrate chemistry and structural biology into your studies? My research group has identified some of the molecular machinery responsible for the processes that produce titan cells. We know this machinery is unique to Cryptococcus, but we don’t yet know how the machinery functions. We will use chemistry and structural biology to determine the functions performed by the molecular machinery. More importantly, we can then synthesize drugs that mimic this molecular machinery but that don’t function properly and use these drugs to disrupt titan cell production. 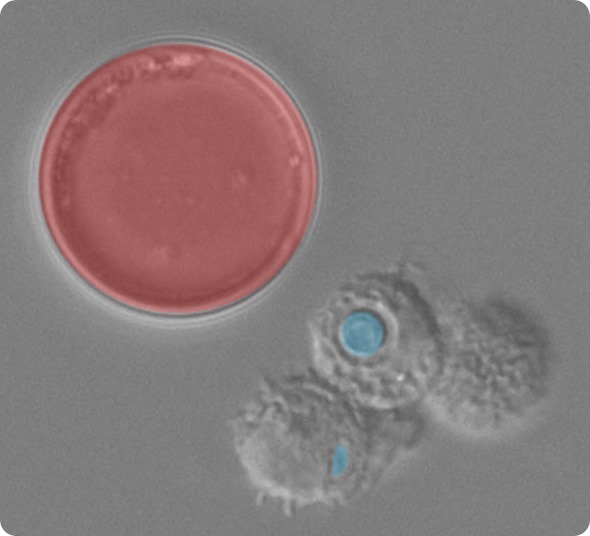 Cryptococcus titan cells (indicated in Red) are larger than host phagocytes (grey), whereas typical size Cryptococcus cells (indicated in blue) are able to be phagocytized and killed by the host cells. Image courtesy of LH Okagaki and K Nielsen. Will understanding how the pathogen causes disease help us to determine ways to treat it? Understanding how Cryptococcus causes disease is a necessary step to design drugs that specifically target Cryptococcus cells without killing human cells. We must identify critical processes that Cryptococcus must do – such as producing titan cells – but that human cells don’t do. Because the titan cells are important for an adaption not performed by human cells, we can use this knowledge to design drugs that target this process. What do you think the future holds for Cryptococcus research and what needs to be done to increase research on this fungal pathogen? Cryptococcus is a complex organism – in many ways just as complex as human cells. In addition, we are only just starting to realize how multifaceted the interactions between Cryptococcus and humans are, and how these interactions impact disease. We now have the scientific tools necessary to understand Cryptococcus and develop new treatment strategies. We have a unique opportunity to make ground-breaking advances in prevention and treatment of Cryptococcal infections that can save millions of lives. We just need more funding and research expertise to be directed towards this deadly pathogen. Additional information about Cryptococcus can be found at the U.S. Centers for Disease Control and World Health Organization. 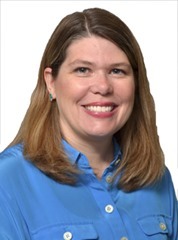 After receiving her Ph.D. from North Carolina State University and performing post-doctoral studies at Duke University, Kirsten Nielsen joined the Department of Microbiology and Immunology at the University of Minnesota in 2007 where she is now a tenured Associated Professor. Her research interests focus on fungal pathogenesis, with an emphasis on Cryptococcus. Specifically, she has a translational research program that combines her expertise in basic molecular/immunological pathogenesis with drug development and clinical treatment trials. Kirsten Nielsen was named a Fulbright Scholar in 2015. 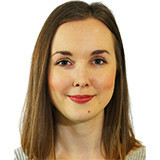 As part of this award, she is currently working with colleagues in the School of Chemistry and Molecular Biosciences at the University of Queensland.